This Build is inspired by AceofSpadesqt's life wandfinder build (link: https://www.pathofexile.com/forum/view-thread/1906135), I did some tweaks on passive tree and gears. a good rolled Piscator's Vigil could still give u over 3 Million damage, u can try it on POB, and it just cost 10-20c. Lycosidae gives us "hits cannot be evaded" mod, so we don't need to invest accuracy on gears and passive tree. Hysteria gloves could give u more life. for rings, u want high life and resistances, and a open prefix to craft flat lightning damage. use this ring if u r really scared of reflect mobs. Belly Of The Beast for more life, u can use kaom if u just want to clear map with kb. for rest of gears, u can just focus on high life, strengths and resistances. Diamond Flask for crit chance, need immune bleed mod. With 50% increased Flask effect on the tree, we can get 30% lightning pen from one single flask. I have 21/20 added lightning gem, lvl 4 empower and lvl 21 wrath, those a not required, currently i have 3.7+ million dps, u can still hit 3+ million damage with lvl 20 gem and lvl 3 empower. With Evasion based armour be buffed in 3.0, QOTF could be a good alternative to Belly. With new hybrid life roll in 3.0, we can probably hit 7k life! How does it fair against reflect mobs? Have you done guardians/shaper comfortably? i sometimes still 1 shot myself against reflect with 10k ES and vinktar up. how can i survive with 6k life? Build is going strong and very fun! Managed to get some quite decent wand too. I got a question however. With accuracy investment, isn't it better to get a proper shield with high life/res? This is my current gear and I am wondering if it would be better to just use lycosidae and go full deeps on the rings. Got 93% accuracy at level 71. Thoughts? Deciding if I should sell it tho, cause it doesn't go well with HoI - CoH - Assassin's Mark. Thoughts? If u can get good gear with accuracy, then ofc u can get rid of lycosidae and use a good rare shield. Lycosidae is just a good budget option, saves currency when choosing other gears. And don't trust the % accuracy, it changes with your level, take a look on your flat accuracy, if u have 2500+ then u r good to go. I try these build on beta. i like it very well, thx for the work. But i will change barrage for single-dmg. Have you any Option ? I dont like it to play it with barrage. 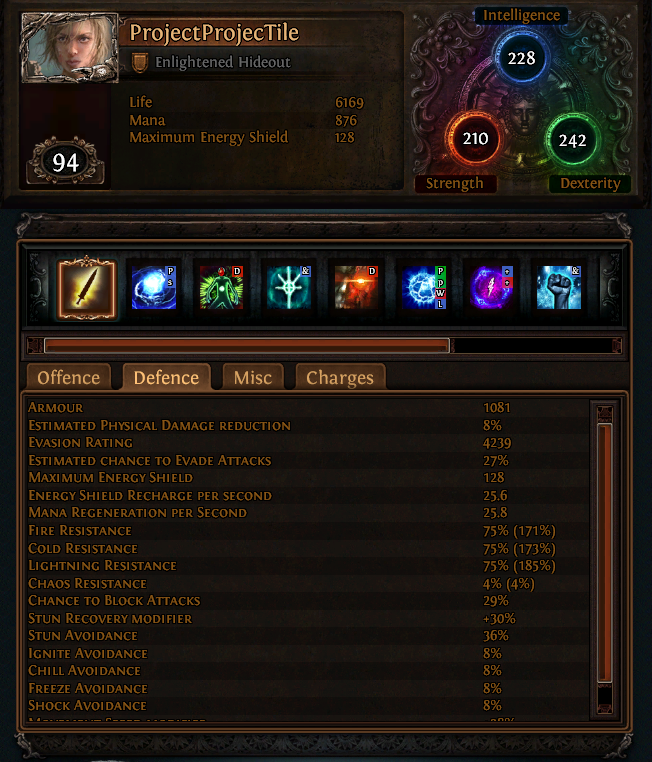 I never use orb of storms.. or very rarely. Can I swap to lightning warp or something?